What to do? A BOIL ADVISORY is for your protection. Boil advisories are issued for a variety of reasons as a precautionary measure usually due to a loss in positive system pressure. The reason for boiling water is to kill disease causing organisms like viruses, bacteria and parasites. 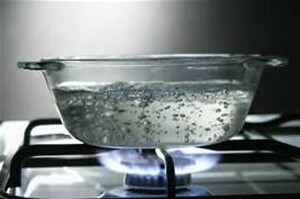 The Center for Disease Control (CDC) recommends boiling water for 1-3 minutes (higher altitudes require three minutes). Do not start your timer until the water begins to boil. Be sure to let water cool down sufficiently before using. Under a boil advisory it is safe to use your water to shower, bathe and wash clothes. However it is not recommended that you use your water for drinking, cooking, coffee making or brushing teeth. Boil Advisories generally last for several days but sometimes longer. By regulation before a boil advisory can be lifted the water company must be able to prove the water is coliform-free for two consecutive days. It takes several days to get back the results. Things outside the control of BCRA like weekends and holidays when the testing laboratory is closed can prolong a boil advisory from being lifted. BCRA appreciates your understanding and always feel free to call our office at (570) 421-3232 if you have any additional questions or concerns.